There is a lot of buzz today around Agile as a different approach to managing projects, specifically software development and implementation projects. Unfortunately, when Agile was first being introduced it was set in opposition to traditional or waterfall project management approaches. This caused an unnecessary and counterproductive riff that was mostly due to a lack of understanding and a few overzealous evangelists. Today Agile is more main stream, particularly in IT, and much of this division has started to erode. However, a comprehensive understand of the mindset of Agile over a few well known practices like the daily scrum, is foundational to truly leveraging the benefits of Agile and creating an environment that if both fun to work in and produces high quality business results. This session on Agile will give you the foundational background that will help you understand how Agile is different and why certain practices make more sense and result in more productive teams. You will see how Agile is as much of a mindset as it is a project management framework and how adopting Agile can turn your next project into a success. This course is designed for users looking to understand and start the process of becoming a certified Agile/Scrum Master. Geof Lory is an engaging speaker and trainer with more than 30 years of practical project management consulting experience. He is the product owner for the Fissure PM and Agile/Scrum Simulations and is certified to deliver various other team, leadership, and project management curricula. He is a Project Management Professional (PMP) and an Agile Certified Professional (ACP) from PMI as well as a Certified Scrum Master (CSM) from the Scrum Alliance. Geof is the author of multiple white papers and articles and the co-author of the MSF Pocket Guide. 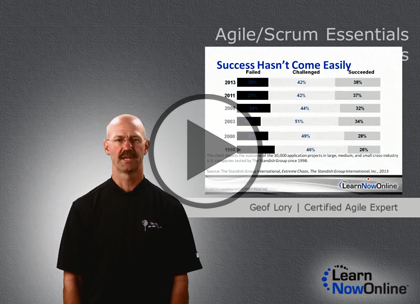 In addition to writing, speaking, teaching, and coaching Agile, Geof continues to actively manage Agile projects, bringing real-life practical application of the Agile values, principles, and practices to life within organizations and creating sustainable change that maximizes project team performance.